As an innovative EMS service provider we offer you complete service along the entire value creation chain under one roof. Our service offer ranges from development to manufacturing and assembly down to after-sales service. Regardless of whether it is the manufacture of electronic components or the manufacture of complete devices and systems: we are your professional partner. We guarantee the highest level of flexibility and responsibility. An experienced project manager as a central contact partner will support you from the start. Thanks to our stream-lined organisational structure you can always be sure of the fastest reaction times. Hardware and software development according to the latest standards and your customer requirements. An experienced team of highly qualified development engineers is at your disposal, complemented by a professional network of external partners. We maintain a close relationship to the Technical University in Sofia, among other things. We are happy to accompany you in product development and thereby ensure the optimum implementation of your ideas. Even in this phase our engineers have an effective manufacturing process in their sights which guarantees you cost-optimised serial manufacturing. Of course, adhering to the highest quality standards is taken as read for us. In coordination with you, we create an optimised circuit board layout. Here, too, cost-relevant aspects, such as the process-optimised adaptation to manufacturing, are taken into consideration. Our core skill is circuit board assembly. 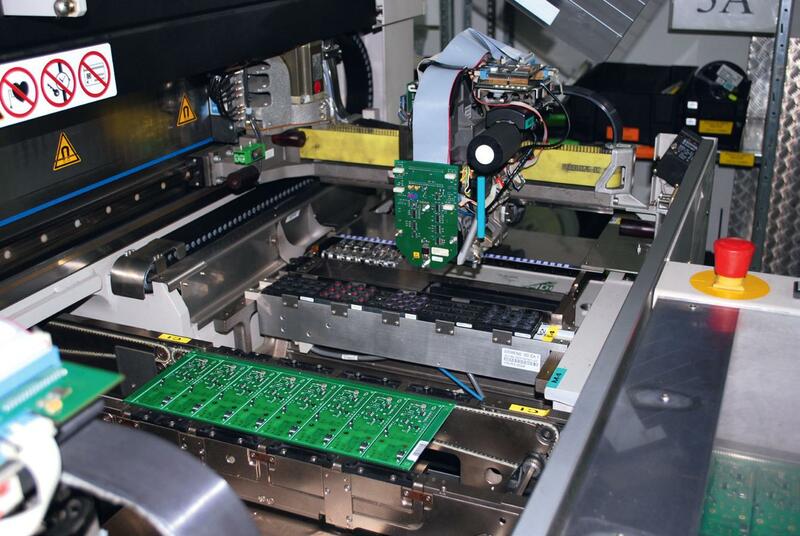 In addition to fully automatic SMD assembly on state of the art manufacturing lines with high-speed assemblers, we also offer complementary conventional assembly solutions in the THT process (Through Hole Technology). Components can be processed in all standard construction forms. Unleaded waves and re-flow soldering carried out according to RoHS standard. In addition to pure electronics manufacturing we also offer supplementary services such as the associated assembly processes. So, for example, we can take on the assembly of electronics and housings for a complete system. We take on the complete material manufacturing. Our international supplier network consists of manufacturers and distributors and, in combination with a comprehensive purchase volume, always guarantees the best prices and conditions while observing the highest quality standards. Through worldwide sourcing we can also source ‘hard to find’ components. We have a purchasing office in Asia to enable us to act on location there.